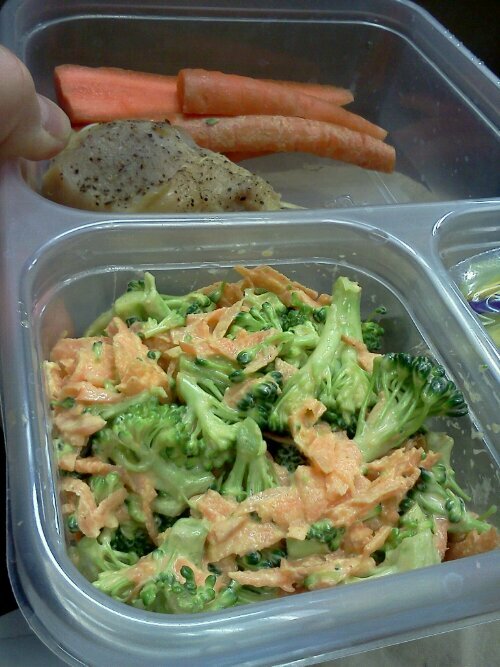 Broccoli Carrot Salad | Robert Mitchell Jr.
Wash three broccoli crowns and scrub four carrots with a veggie brush. Chop broccoli into sm/med pieces. Grate carrot (on the big side of your grater). Add 1/3 cup olive oil mayo (plus/minus — to your taste) and 1 tbsp of brown mustard. Stir. Eat. Makes about 5 servings. This week for lunch I’m packing a cup of this along with a baked free range chicken drumstick, a Wholly Guacamole single serving pack, and either celery, sugar snap peas, or carrots for dipping. This entry was posted in Green, Martial arts and tagged 4HB, recipe. Bookmark the permalink.